Assemblyman Oaks & Right to know you’re a parent. As many of you this a big step. It would fully recognize and protect the basic Civil/Human Right we all have to be parents to our own children, and for our children to have BOTH parents in their lives. Perhaps the introduction of a Law (even at the State level), that directly addresses the concept of equality in parenting might help. What better place to start than at birth? Shouldn’t biological parents have the “right” to know they have a child? John Murtari, Group Coordinator, has been involved in discussion with his member of the State Legislature (New York),Assemblyman Robert Oaks (click for his website). You can read a complete history below. John has spoken with him in person several times and also members of his staff. They are all very nice people, but right now he feels there would be strong political risk in such a Bill and will not introduce it. I hope that through our positive efforts we can convince him otherwise. Obviously, in almost all cases a mother knows that she is going to be parent and this Act hopes to bring equality to fathers; however, as science advances we may soon find the ability to take an ‘egg’ and bring it to term — and perhaps ignore the biological mother. 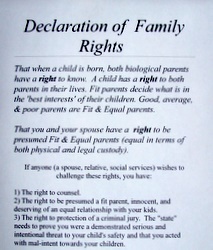 But remember, our group goal is to ensure we are all considered Fit & Equal parents. The discussion of this Act would help not only Fathers, but Mothers, and also those who have suffered from false child abuse allegations. Why? It will get people thinking about Family Rights and how those rights should be recognized and protected. None of the Act is ‘proprietary’ — anyone is welcome to modify it and use it within your state. JOIN THE EFFORT: Let’s help convince him and other good people like him that the time has come. You are welcome to call/write him (contact info below). We are trying to find parents to join John (See schedule and details below!). Recent History (most current info at top): Your participation and support is invaluable – click here for an earlier message and check here for recent list messages. Email john at: jmurtari@AKidsRight.Org As of March 12th, parents have contributed $245.00 to help John with expenses. Thank you! 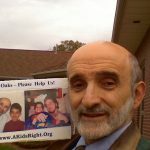 October 27, 2011 – Jack Frost, coordinator of the Group New York Father’s 4 Kids, is organizing a Rally from Noon-2 PM outside the offices of Assemblyman Oaks in Lyons, NY (click for directions). He’ll be coming as Captain America and with other parents we hope to convince Assemblyman Oaks that he should introduce legislation that promotes the right of both parents to know they have a child! 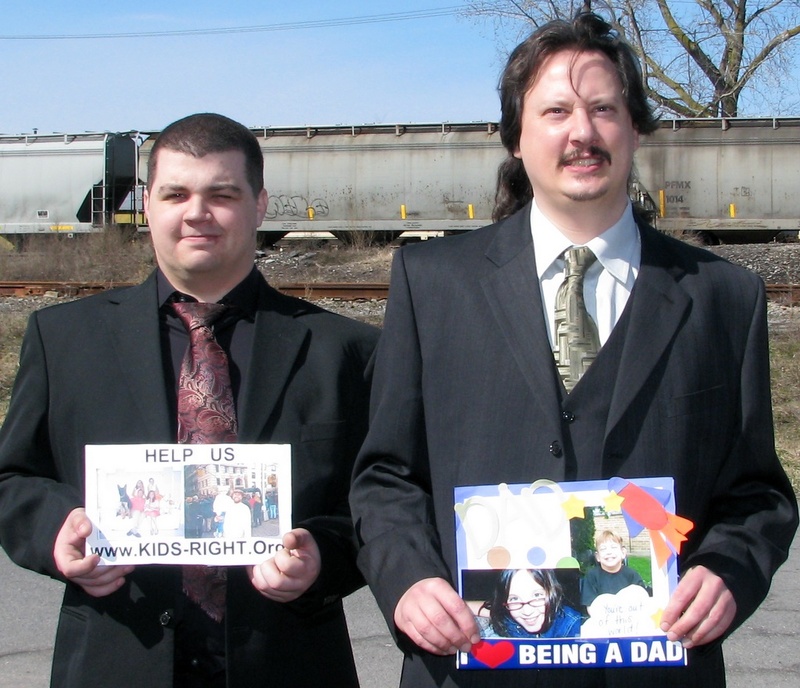 May 3, 2010 – John and his attorney were ready for trial. His attorney had put on notice an assistant DA that she might be called to testify for the defense. John had alleged in a complaint that a deputy had lied to a Judge during an arraignment (see details on March 15th below) — and this same deputy was to testify at trial. Before the trial began the ADA told the Judge the County was “not interested” in prosecuting the remaining trespass charges and moved for dismissal. Thankfully, all done! 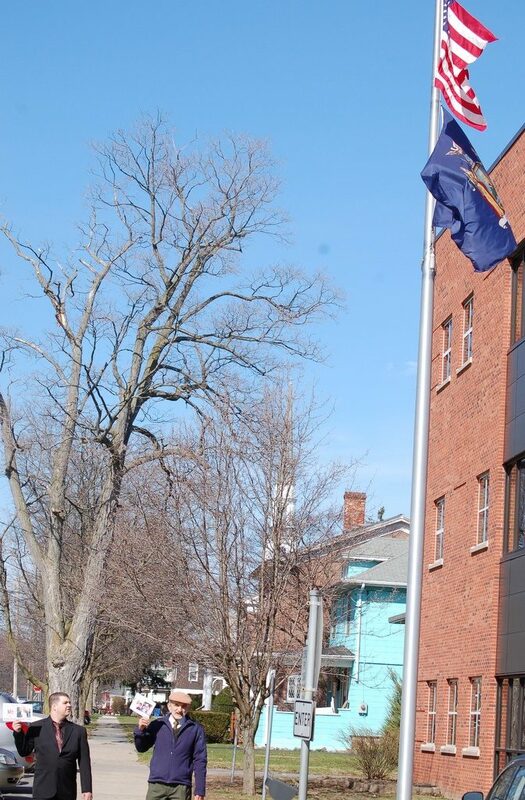 April 14th, 2010 – There was an appearance in Lyons Village Court, John’s assigned counsel, Mr. Andrew Correia (Wayne County Public Defender), did an excellent job in arguing the two pending simple trespass charges (violations) should be dismissed. He made it clear the “accusatory instrument” did not even allege facts necessary for the crime. The DA argued against dismissal (but gave no specifics). Judge Nicholas Forgione refused to dismiss the remaining two charges stating he, “wanted to hear from the police officers…” A bench trial was scheduled for May 3rd. 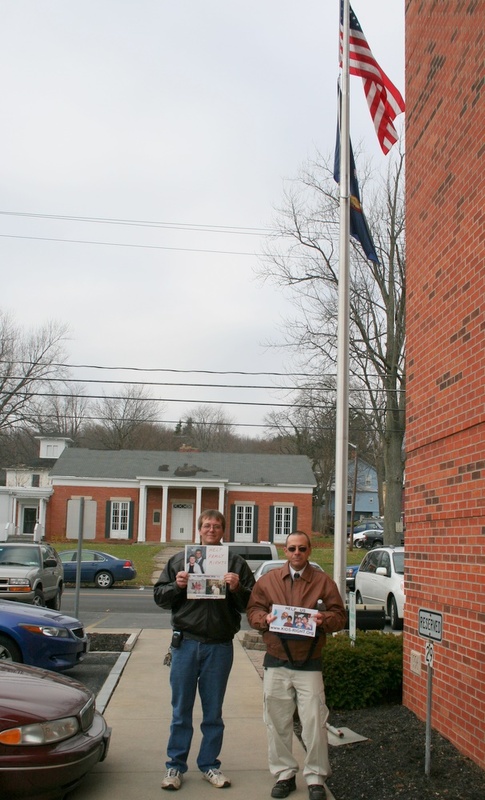 March 31st, 2010 – John was joined by two other parents from the Albany area, Jack Frost & Jeff (both shown standing in front of the Courthouse). They first went to the local offi ce of Assemblyman Robert Oaks and spoke for about an hour with his aid. She listened carefully to both their stories and asked questions. It was a worthwhile visit. After that they went to the Courthouse The initial plan was to quietly walk the sidewalk in front of the building; then Jack & Jeff would leave the area and John would resume his chalk writing activities as before. In a surprise, building security approached and said they could not walk on that sidewalk — they could only walk on the street side walk or the police would be notified. They did this for about 40 minutes. Jack & Jeff then left the area and John started to walk in front of the building (no chalk activity at all). Security approach him again and said he had to leave or the Lyon’s police would be called. John kept walking as the Lyon’s police arrived and entered the building. A while later two Sheriff’s vehicles also arrived. The Lyon’s police then left with no action. A while later a Sergeant from the Sheriff’s office told John they had “no problem with him walking in front of the building,” but they didn’t want any more chalk activity. He then left. John continued his walk for about another 30 minutes and then left at 5 pm. It was great to have two other parents with me. I look forward to the day when I will have both a Man & Woman with me willing to take chalk, risk arrest, and write “I LOVE MY KIDS” outside this building and others. As today showed, once we learn to stand up for our rights and our dignity — other people will respect it also. But it starts with us! I had to suspend my activity because I was just running out of money to support myself…but I plan to resume by late July! 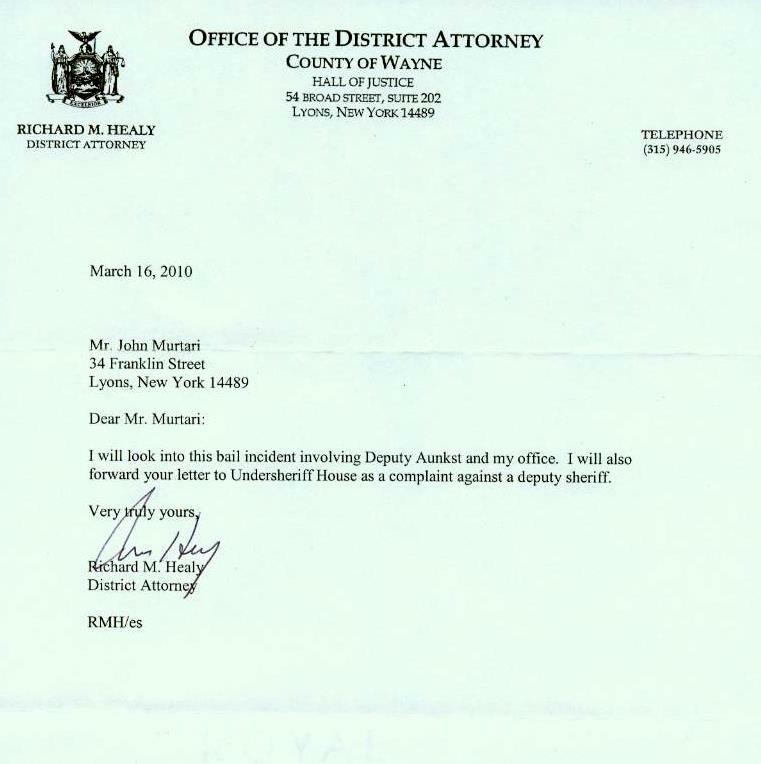 March 15th, 2010 – John filed a complaint both with Wayne County Undersheriff Richard House and Wayne County DA Richard Healy regarding alleged lies told by a Deputy during his arraignment on Feb 18th. In a bit of a surprise, the very next day he gets an acknowledgement signed by the DA. About two weeks later he got a response from the Sheriff’s office regarding their investigation of the incident. John felt questions remained and wrote another letter to DA Healy. You can check the links above to read the details. When I was arraigned the Deputy told the Judge the DA wanted my bail set at $2500 (pretty high for a little chalk!). He even confirmed who he talked to in the DA’s office. It was all made up and seemed so unnecessary! Many of you have experienced the same thing as you fought to keep a relationship with your children — this is one reason I feel so strongly that parents have a right to jury of their peers and a unanimous verdict (which is what any criminal gets). We are all liable to petty biases and a desire to short-circuit procedure to due the “right” thing. Having to convince twelve people taken off the street based on evidence presented in an open trial — is a pretty good barrier to abuse. Mar 10-16th, 2010 – My assigned counsel, Mr. Andrew Correia, expressed his frustration to Judge Forgione regarding the failure of the DA’s office to file a response to his two motions for dismissal. He asked the Judge to grant the motion, especially since an almost identical motion had been granted back in January on four other charges. The Judge wanted to talk to the DA’s office before doing that, the matter was adjourned again until April 14th. On the 16th the DA filed a response, agreeing to dismiss all the graffiti charges, only the two trespass charges remained. Feb 23-24 – After six days in the Wayne County jail John was released the day before his court date. Many people in the group had written and called officials on John’s behalf — it was appreciated!!! There was a court appearance on the 24th. A two week adjournment was granted to give the DA’s office more time to determine their response to a second motion for dismissal. Next date is March 10th. 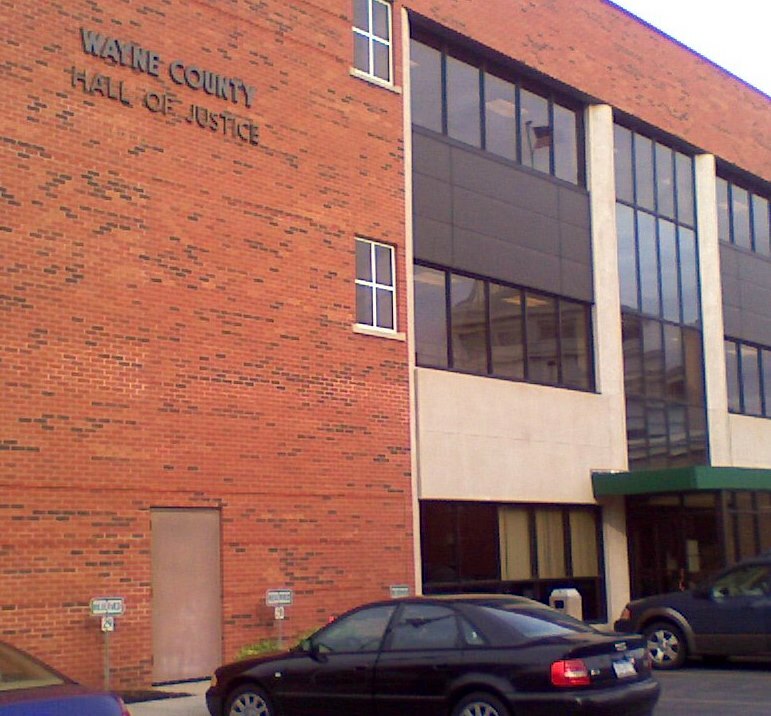 Feb 18, 2010 – There was a Wayne County Board of Supervisors meeting scheduled for 9AM in the old Courthouse (adjacent to the new where prior activity occurred). John left his “Mr. 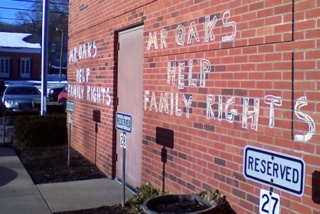 Oaks – Help Family Rights” message on the wall near the front door and then quietly walked up & down the sidewalk as members arrived. John was arrested and had his bail set at $2500. His next court date is Feb 24th. Click here for more info. Feb 17, 2010 – New York state Assemblyman Robert Oaks is meeting with members of the public in Lyons. John has a time scheduled at 1:30 pm and you are welcome to attend. Please contact John. Click here for a map to the Town offices. Feb 10, 2010 – John appeared in Village Court and his assigned counsel, Mr. Andrew Correia, submitted a motion to dismiss the charges on insufficiency. The DA’s office was not certain on their response and a two week adjournment was granted. The next court date is Feb, 24th. Feb 8th, 2010 – In a surprise, John was released a few days before his Court date. Many people in the group had written and called officials on John’s behalf — it was appreciated!!! Feb 3rd, 2010 – A front page story appears on the Wayne County Star, a regional paper. Click here for a copy of the story. January 27th, 2010 – There was a Wayne County Board of Supervisors meeting scheduled for 9AM in the old Courthouse (adjacent to the new where prior activity occurred). John left his “Mr. Oaks – Help Family Rights” message on the wall near the front door and then quietly walked up & down the sidewalk as members arrived. At about 9:15 a Sheriff’s deputy initially arrested him for Trespass, telling him he had no right to be on County property to petition his Assemblyman. His bail was set at $1000.00 Click here for some complete details on his arrest, thoughts on jail, and upcoming court date on Feb 10th. January 21st & 26th, 2010– John returned to the building on both days to continue efforts for reform and added another message to the outside wall. He also wrote another letter to Assemblyman Robert Oaks asking him to please take action of Family Rights issues. John included a photo collage of the group efforts over the past few months. I had told security last week, that I was willing to wash the stuff on Thursday afternoon (since I would be done for the week). I went in today and was told they hadn’t gotten any instructions on cleaning yet. I will be going back next Tuesday to resume. J anuary 20th, 2010 – John returned to the Courthouse and wrote “Mr. 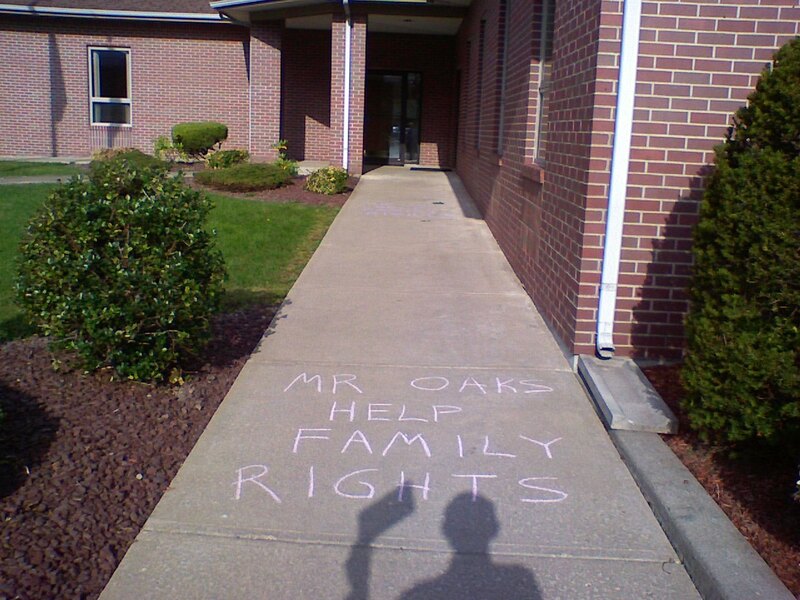 Oaks – Help Family Rights” in much bigger lettering with kid’s chalk and next went in and told security. He then spent about an hour outside in silent picket before going home. The effort is scheduled to resume again tomorrow, Jan 21st, outside the Wayne County Courthouse in Lyons at 2PM. January 19th, 2010 – John returned to the Courthouse, wrote “Mr. 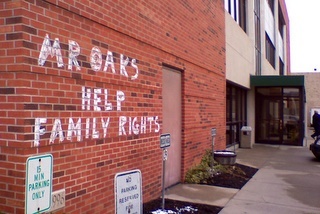 Oaks – Help Family Rights” on about 7 different areas on the outside walls with kid’s chalk and then went in and told security. People ask me how I can keep doing this. It’s pretty easy when you consider the indignity I have been through. FIRST, I’ve been very fortunate to keep a strong relationship with my son — that is something so many parents lose and any parents nightmare (I should ‘give back’ by trying to help others). SECOND, I’ve struggled with a child support disaster. I live in a rural community and have had my license suspended for over a year, forced to walk. January 12th, 13th, & 14th, 2010 – John returned to the Courthouse, wrote “Mr. 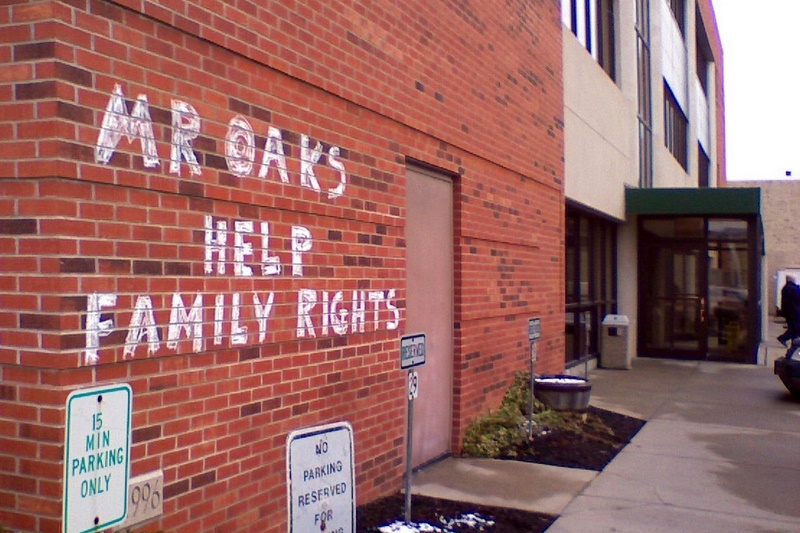 Oaks – Help Family Rights” in a different area each day. He then went in and told security. On Thursday, the 14th, I knew I wouldn’t be back later in the week — so I went in a told security that if they gave me a bucket of water & a brush, I’d remove the wall writing that had accumulated over the week. They told me not to worry about it. I plan to do a bit more next week. Back in November, John had written a plea for reform to his local Assemblyman, Robert Oaks — still no response. January 6th, 2010 – All four pending charges are dismissed. John’s assigned counsel, Attorney Ms. Denise Munson, has done an excellent job in advocating for his rights as a defendant. She submitted a very effective motion (text) quoting good case law and asking for dismissal of the four pending charges based on the idea that “chalk can’t damage” and there was no “intent to damage”. The DAs office concurred with the motion and also agreed with dismissal. I was very happy with the result. I had been ready to resume my activities on the following week and having this decided first should make things ‘simpler’. As part of what I can only call ‘harassment/intimidation’ the DA’s office had earlier requested a psychological examination over my competency to stand trial. This was complete in early December and you are welcome to read two reports by both a Psychologist and Psychiatrist. This was setup the night before. Mr. Moran had seen an arrest report for chalk in one of the local papers and thought it sounded strange. He contacted me and setup the on-air interview. He was a good host, the segment is about 15 minutes — it was cut short because of other schedule conflicts. December 1st – John again returned to the Courthouse. He held a silent picket for a while and then used kid’s chalk to leave a message on the building. He wrote it once and then went inside the building and told security. He was arrested, but then in a bit of a surprise, he was released with just an appearance ticket. His next court date is Dec 9th. Click here to read some of your FEEDBACK on this activity. 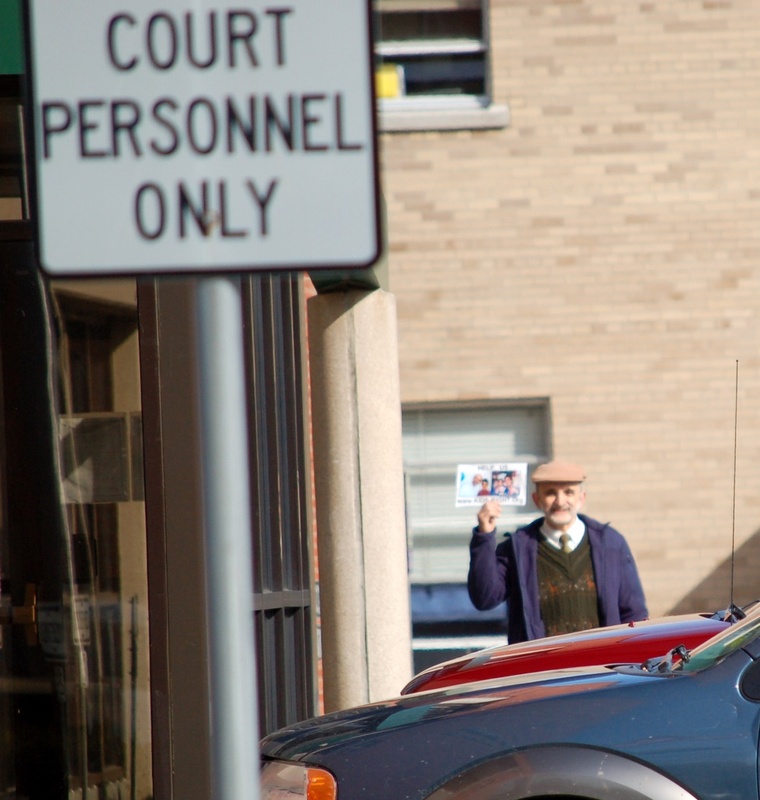 November 25th, 2009 – John was taken from jail to Village Court and he was released. The next court date was Dec 9. John does plan on resuming his activities again next Monday, Nov 30th. This was a bit confusing. The DA wanted me released on my own recognizance (which basically means we trust that you will show up at your next Court date). The Judge said no and ordered me on the pre-trial release program which is sort of an easy-probation. Conditions can be set on your behavior, required to call in periodically, etc.. (I normally never agree to those terms). They did release me from the jail even though I refused to sign any program forms and they could arrest me at any time. The ‘system’ really isn’t designed for this type of activity from a non-criminal. He was arraigned by Village Justice Forgione, a $1000 bail was set, and John was jailed again. 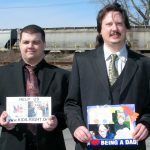 November 23rd, 2009 – In the morning two other parents (Mark Hough & Scott Rhodes) joined John is a visit to Assemblyman’s Oaks office and had a good conversation with an aid. They then went to the Courthouse at 11 AM and carried on a silent picket outside for about an hour. John also sent a letter regarding parental rights to Assemblyman Oaks. He also continues to write local Family Court Judge Sirkin regarding a delayed support decision and the injustice hurting his family and many others. November 18th, 2009 – In a bit of a surprise, John was released. Due to a death in the Family, John will not be returning to continue his efforts until Monday, November 23rd. We’d like to get another Mom & Dad there to show support. 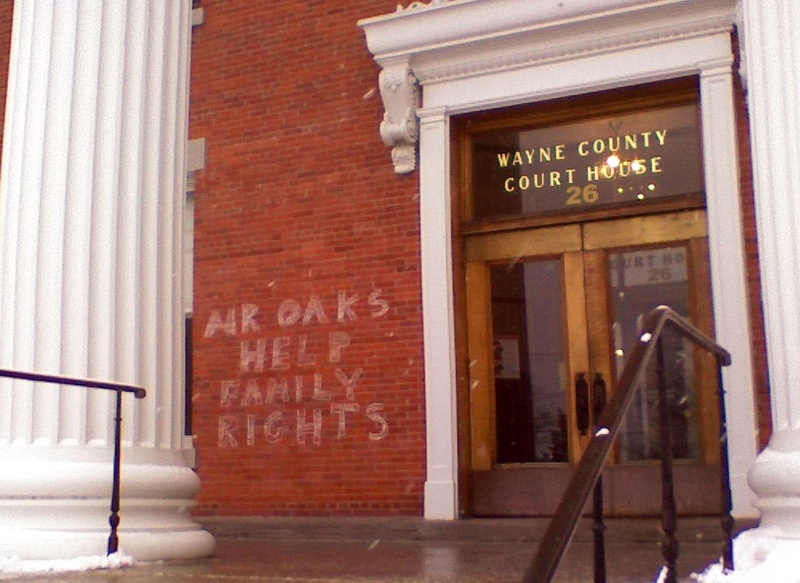 November 16th, 2009 – John returned to the Wayne County courthouse to continue writing “HELP FAMILY RIGHTS” on the building. He was arrested, assigned a $500 bail by Village Justice Nicholas Forgione, and incarcerated at the Wayne County jail in Lyons. November 13th – Due to some legal paperwork John had to complete for a prior employee he will not be resuming his efforts today — next scheduled day is Monday, Nov 16th. 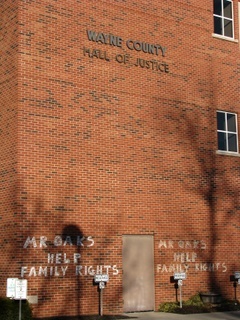 November 12th – At 2 PM, John wrote the same “HELP FAMILY RIGHTS” message on the outside wall of the building. Still using kid’s chalk, still very easy to remove — but harder for officials to ignore. He wrote it once and then went inside the building and told security. They took a look and in about 30 minutes the local police showed up. He was taken into custody and charged with a misdemeanor, in violation of Section 145.60(2) of the New York Penal Law: “No person shall make graffiti of any type on any building, public or private…..” He was released with an appearance ticket for the local Village Court on Nov. 25th . I DON’T WANT TO GO BACK THERE ALONE TOMORROW! There will be another arrest and most likely jail. I would much prefer to find a Mom & Dad willing to join me next week in more chalk writing on the sidewalk outside the building. With three people we could turn it into a media event — and that would help all of us! But there’s always a risk. This is not about winning or what other’s may do in response. Actions such as these first convince “us” that what we want is worth the potential sacrifice. 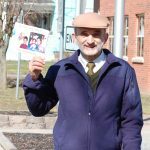 November 9th – John returned to the building with eleven small posters asking the Assemblyman to “HELP FAMILY RIGHTS”. . He taped the sheets of paper to several windows along the front of the building. Building security told him he couldn’t do that and took them down — John placed a few more and then quietly walked outside the building. November 4th, 6th – John returned to the building and continued writing. John stayed outside from 2-4 pm and then left. Nov 5th was rained out). November 2nd – John returned to the building and continued writing. He was told he could write on the sidewalk, but would have to clean it up before he left for the day. If he did not clean it, he was told an arrest warrant would be issued. 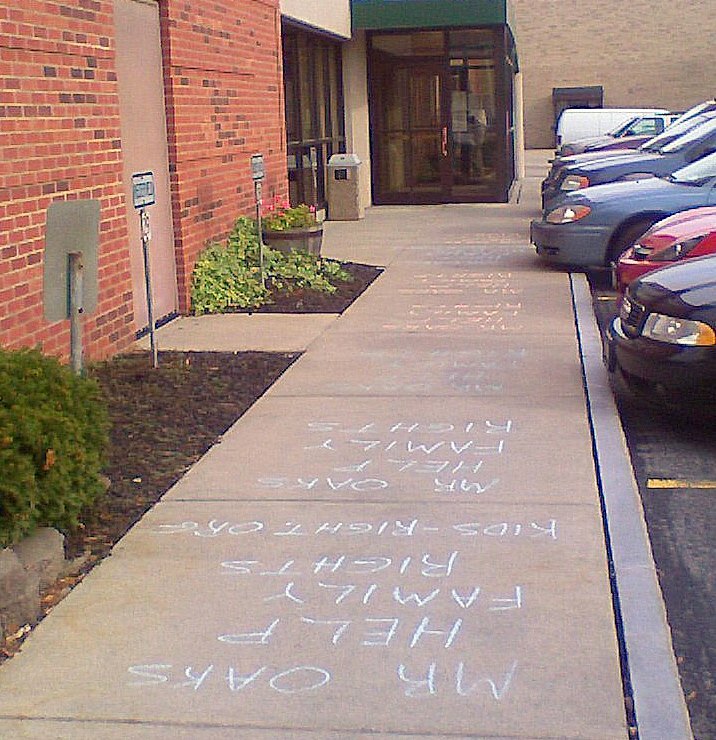 John stayed outside from 2-4 pm and then left, with the message still on the ground. (the Court House was closed for election day, Nov 3). October 28-30, 2009 – Rain & wet sidewalk delay! October 26, 2009 – The effort was resumed at 2 PM outside the Lyons, NY, Village offices at 76 William St. Why even take these risks – You’ll feel better! 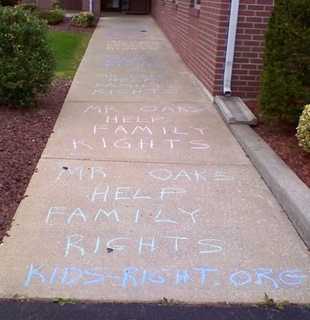 October 22, 2009 – John returned to the office with more chalk and continued his chalk writing campaign and filled the sidewalk you see below with “Mr Oaks – Help Family Rights”. He dropped off a preview DVD of the movie “Support? System Down” with an aid. John was one of the people interviewed in jail for the film and it also contains other scenes of parents and legislators filmed at the state capital in Albany. He hopes it will encourage Assemblyman Oaks to reconsider the need to explicitly define and protect Family Rights. 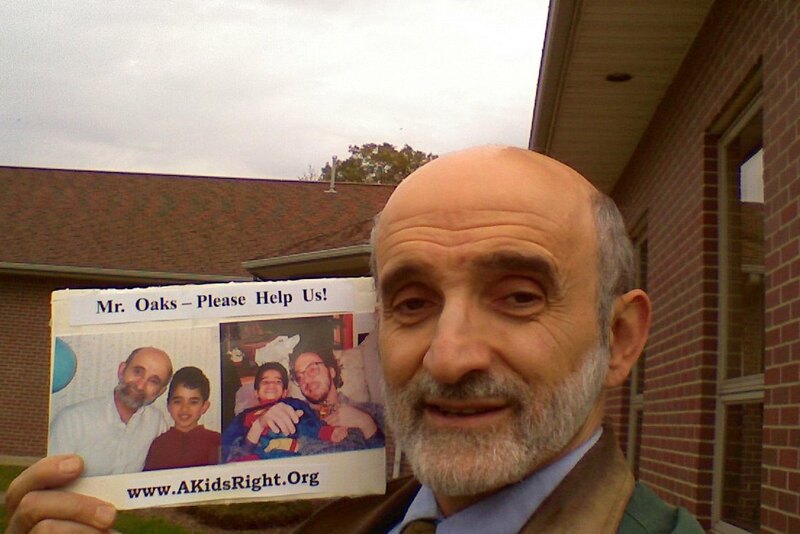 October 21, 2009 – John resumed his NonViolent action outside the offices of Assemblyman Oaks. He left a couple of messages written with kid’s chalk on the sidewalk and walked up & down the walk for a couple of hours. He has closed hisweb hosting business and still cannot drive while living in a rural area. Risking arrest as part of a peaceful action for reform is an easy decision. — John was concerned about Summer vacation with his son, and suspended actions till after the summer. 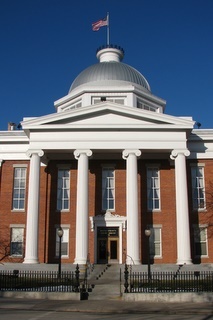 February 13, 2009 & Feb 17th – Group coordinator, John Murtari, decided to walk inside the new County Court House in Lyons. Security staff was polite and John quietly walked around for an hour before leaving. 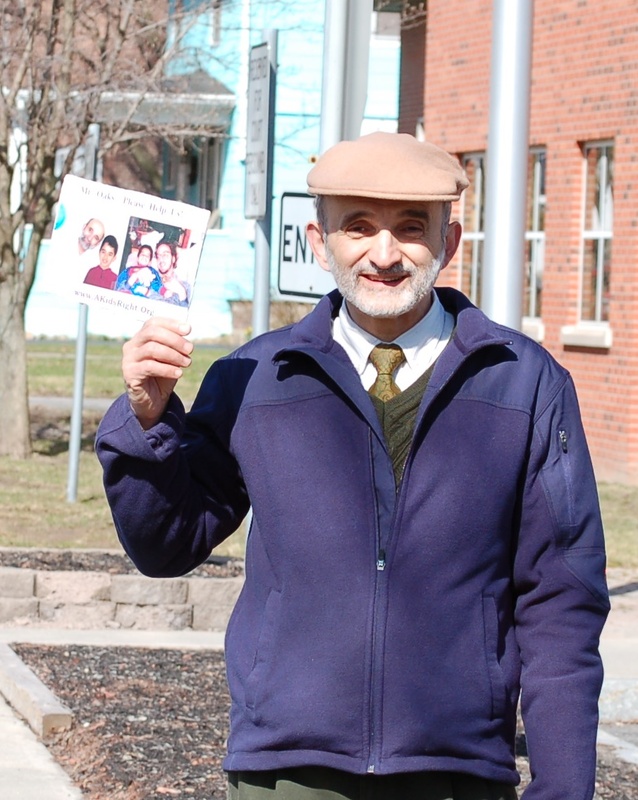 He held a small placard with pictures of parents and children. The message, “Mr. Oaks, Help Us!” (photo above). 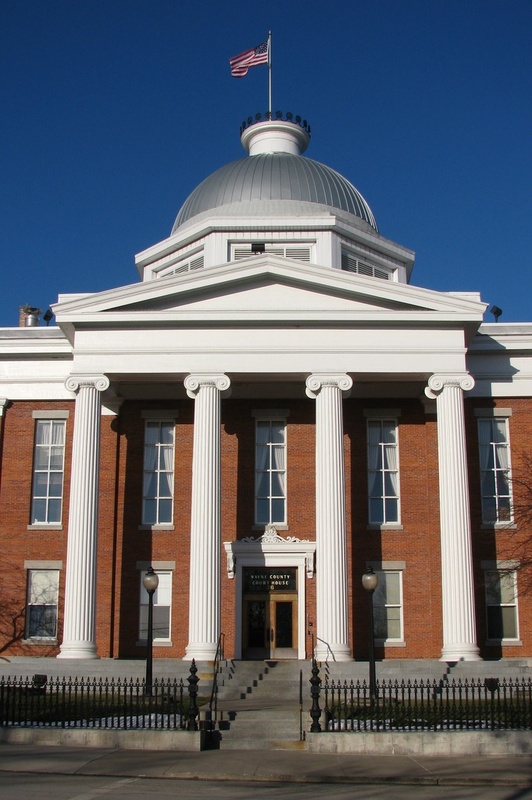 February 10, 2009 – John took a ‘walk’ inside the historic Court House in Lyons (now used mostly for County offices and meetings). For two hours he walked in the hallway of the building holding a small placard with pictures of parents and children. Feb 4-9, 2009 – John changed his location to downtown Lyons and outside the County Court House. Please contact John if you wish to participate and join in the effort. 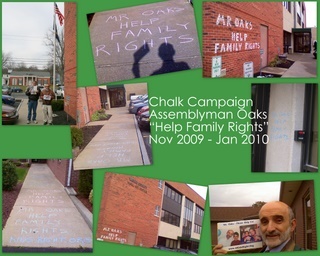 January 27, 2009 – At 2pm, John Murtari walked to Assemblyman Oaks’ office to publicly promote the “You’re a Parent Notification Act.” He walked outside the offices for about two hours (lucky it was a sunny day, temperature in the mid 20s). One of the staff members did come out and told John he was welcome to come into the building to warm up. Weather permitting, John plans on returning each day at 2pm for a similar two hour vigil. 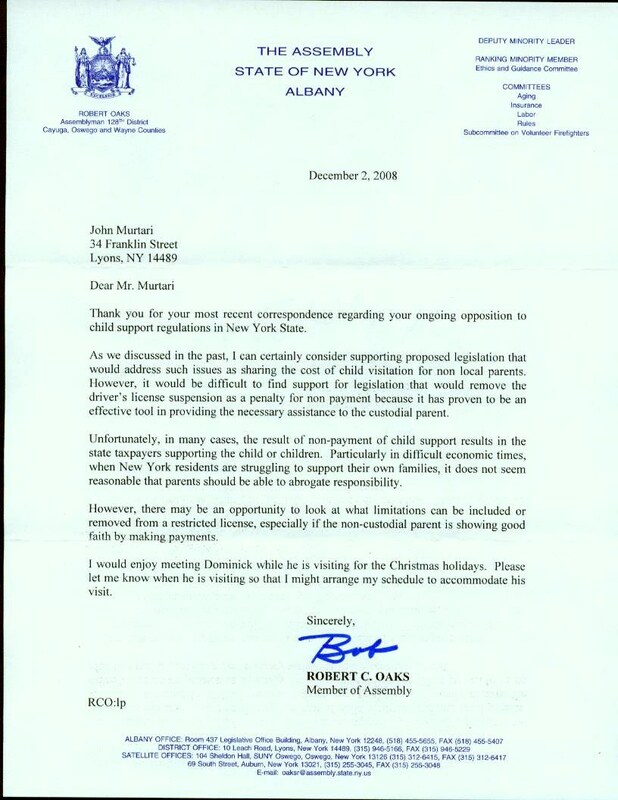 January 9, 2009 – John Murtari, group coordinator, sends another letter to NY State Assemblyman Robert Oaks. Final planning is done and a start date of Jan 27 (rescheduled from Jan 20 because of inauguration) is set. Please contact John if you wish to participate. April 4-5 2007 – The resolution is considered in the Rules & Legislative Committee and also the Social Services Committee of the Wayne County Board of Supervisors.. There is quite a difference in how it is received and handled by the two committee chairmans, John writes Mr. Hoffman again a few days later to express some concerns and asks for the opportunity to address the full Board well before any final vote. This is denied and no vote occurs. Mar 12, 2007 – To increase public knowledge of this basic Civil Right, John wrote a letter to Mr. James Hoffman, Chairman of the Wayne County Board of Supervisors. This is a small rural county in upstate New York where John resides in Lyons. There is no county legislature, each of the elected Town Supervisors also server on the County Board. The resolution is much simpler at this level, it just asks for State and Federal Legislators to draft such legislation. Feb 2007 – John meets personally with Assemblyman Oaks at one of his public ‘office hours’. There was concern about potential opposition to such a bill and they discussed different approaches and concepts involved with the bill. The meeting lasted almost an hour and the Assemblyman told John he would be able to follow up on the bill more after the State Budget was passed. Jan 3/8, 2007 – John follows up again with the Lyon’s staff of Assemblyman Oaks to find out what progress is being made. He is told they are checking. It appears the Assemblyman does not have a position on the bill. John is trying to arrange an appointment at his local office. May 15, 2006 – Another letter is written to Assemblyman Robert Oaks regarding the need for the act and a hope it will be acted on quickly. We are told that the wording of the bill is reviewed by legal staff used by the Assembly to review bills for any legal obstacles. May 11,2006 – After speaking with the Assemblyman and some aids a DRAFT of the bill wording and a sponsors memo is sent to Assemblyman Oaks. It is late in the session and this bill does introduce new concepts, but we hope discussion can begin now.